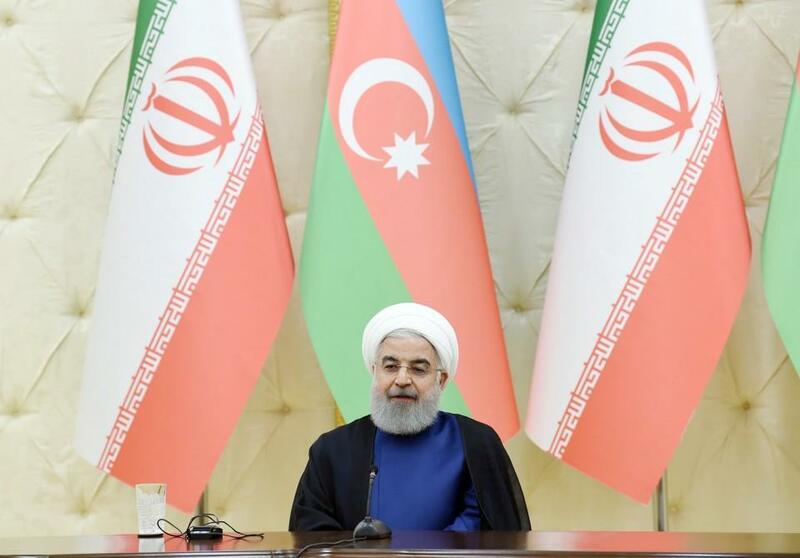 President Hassan Rouhani has said that mutual respect and trust between the governments of Iran and Azerbaijan have developed over the recent years. “The trust between the governments of the two countries have grown in the recent years. Mutual respect has increased and the sides have been engaged in more joint projects. The two nations and governments today witness the positive outcome of cooperation,” he told a joint press conference with his Azerbaijani counterpart, Ilham Aliyev, in Baku on Wednesday. Saying the sides have decided to strengthen cooperation, Rouhani added that such cooperation will leave a lasting impact. Terming some documents signed between the two countries on Wednesday as “historic”, he added that these documents will benefit the two nations and the region as well as the world. President Rouhani arrived in Baku, Azerbaijan on March 28 on a two-day visit for diplomatic and economic talks. The presidents of the two countries oversaw a ceremony for inking eight documents on the expansion of cooperation in several fields, including oil and gas, transportation and health. “The cooperation in transit sector, which links Iran’s southern waters to the Caucasus, Central Asia and Russia as well as the north and eastern Europe through railways and roads, is an indication of the significance of the North-South corridor. The decision made today for the joint inauguration of Rasht-Astara railway shows the understanding of the two countries about the significance of the corridor. The president went on to speak about ample opportunities for cooperation in the Caspian Sea and said the sides must make the maximum use from the waterbody through cooperation in the fields of science, economy, trade, maritime, fishing and tourism. Saying that the sides today decided to jointly make use of resources of the Caspian Sea, he added that the agreement would show how the sides can cooperate in this regard. The two countries’ decisions on joint investment, including the Astara (Azerbaijan)-Astara (Iran) railway and also the joint production of cars display the strong will of the two countries to widen cooperation, he added. Rouhani said the opportunities for future cooperation on creation of a joint pharmaceutical plant and also cooperation in healthcare sector, as well as the swap of gas, investment in energy sector, and tourism indicate that the sides are capable of taking new steps in favor of common interests. President Rouhani further said the sides have also decided to expand cooperation in the banking sector and work on a preferential trade agreement in order to facilitate trade.